Many of the questions we get from webmasters boil down to “How does Google work?” What most webmasters are really asking is, how do I get my site to appear in search results? The first step of this answer is that your site needs to be discovered and comprehended by search engines, and understanding the fundamentals of how search works will help with this. Google has lots of computers that continually visit and analyze web pages it knows about. These computers are collectively known as Googlebot. We give Googlebot an initial set of sites, then send it out to visit those sites. It scans the content, and then follows links to other sites or pages that it finds. It then repeats the process on each page it lands on, and continues to spider out, hence the term "spidering" or "crawling" many use to refer to a search engine's discovery process. When Googlebot visits a webpage, it downloads and stores a copy (called a “cached” page) to our index. It analyzes each page, noting the words and any other relevant content. Googlebot understands some types of content, like text, better than others, like images or Flash (you can find some ways to make these better understood in Webmaster Academy). In order to perform well when customers search for you, it’s important that Googlebot can access and understand the content of your website. Each time someone searches on Google, our ranking algorithms draw up a list of relevant webpages from the index of information that Googlebot has saved while “crawling” the web. This list is given back as the Google Search results page. To see if your website is included in Google’s index, you can use the site search operator, restricting search results to your site’s domain. For example a search for [site:youtube.com] would only show results from the website youtube.com. If you’re interested, there’s a lot more to learn that’ll help you build your online presence at the Webmaster Academy. In our next post, we’ll explain best practices for brick and mortar business owners. If you don’t yet have a Google+ Page for your business, we encourage you to create one now. And if you do already have one, hold tight for news on how to get it linked to your local listing. Follow our blog, or our Google+ page, for additional updates. When a business owner's hard work and passion are celebrated and shared by customers, a humble space can become more than just bricks and mortar, but a favorite spot, a local landmark, or a meaningful memory. With the release of Google+ Local, rolling out today, we are bringing the community of Google+ to local business owners around the world. We aim to improve the way people discover new businesses, rediscover places they love, and share them with their friends across the web. The first thing you’ll notice is the new layout and design for the listing for your business. All your basic business information is still available. And by streamlining the layout and putting more focus on photos and reviews, we hope to help you highlight what makes your business truly unique. With these updates, we’re connecting the millions of people on Google+ to local businesses around the world. With one listing, your business can now be found across Google search, maps, mobile and Google+, and your customers can easily recommend your business to their friends, or tell the world about it with a review. For years, Zagat has provided trustworthy, concise, user-generated reviews, and we are excited to bring these to Google+ Local. We’ve also updated our scoring system to Zagat’s time-tested 30-point scale, so that users can better share their view about what makes a place unique. If you are a business owner, you should continue to manage your information in Google Places for Business. You’ll still be able to verify your basic listing data, make updates, and respond to reviews. For those who use AdWords Express, your ads will operate as normal as they’ll automatically redirect people to the destination you selected, or your current listing. We know many of you have already created a Google+ Page for your business, and have been hosting hangouts and sharing photos, videos and posts. 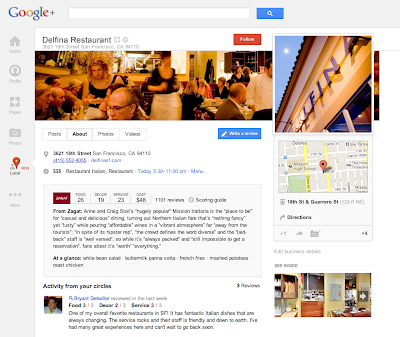 We’re excited that we’ll soon extend these social experiences to more local Google+ pages in the weeks and months ahead. To give you a sense of what’s coming, we've worked with a few business owners to fully upgrade their listings early and share their Google+ business identity across Search, Maps and Mobile. anymore. Our blog is really about bringing you the stories, best practices and updates that can help you make the web work for your business, and we wanted to emphasize that. With that in mind we’d like to introduce the new Google and Your Business blog, here at googleandyourbusiness.blogspot.com. Be sure to subscribe to stay up to date about new tools, product news and general tips to help you grow your business. The Google Small Business blog has been around for a couple years now. Some things have changed since we first started, but the idea has always been to introduce business owners to Google tools and tips that help them grow their businesses and run them more effectively. But we got to thinking - the name “Google Small Business Blog” doesn’t really capture what we’re trying to achieve anymore. OK, the words “Google” and “business” were pretty good, but these days no one is really small anymore. Our blog is really about bringing you the stories, best practices and updates that can help you make the web work for your business, and we wanted to emphasize that. Google Earth’s client software that's used primarily as a visualization tool. You may have even used it once or twice to swoop in to the globe and check out your house! And Earth Pro is a professional product with a few additional features you can use, which we dive deeper into during the Hangout. What are some features of Earth Pro that can help my business? Advanced measuring tools: Quickly and easily measure and stylize complex polygons. Property developers and building designers can quickly estimate the area and perimeter of a property. Afterward, they can quickly stylize the polygon so it’s easily seen on their map. Save premium imagery: Save premium images of the maps you create in Earth Pro for inclusion in your business materials. Save a premium image of all your customer locations to share with your investors. Bulk data import: Import and stylize CSV files (with address or lat/long data), GIS shapefiles, or GPS data to include in the maps you create. Real estate agents quickly upload and locate all the properties in their portfolios by importing CSV files containing the addresses of their properties. U.S. premium data layers: Take advantage of the robust U.S. Demographic, Parcel and Traffic Count data layers that are a part of the Earth Pro package. Architects fly to the location of their next project, use the parcel data layer to find the parcel number, and use the parcel number to find the zoning restrictions for the property they’ll be working on. Movie Maker: Quickly and easily create high-definition movies. Nature touring companies create high-definition videos using Earth Pro that take you along the path of their tours. Do I have to commit to buying Earth Pro upfront? Nope — just sign up for a free seven-day trial to see how you like it. To learn more about how to get started with Google Earth Pro, check out our overview site (FAQs, customer stories, and more!). And remember to tune in to the live stream of our next Hangout at 11 a.m. PT Wednesday May 30 when we teach you more about AdWords. was proud to take the stage with several local small business leaders for a panel discussion on growing businesses and relationships online. Joined by 80 other Detroit-area businesses at the Michigan Minority Procurement Conference, the panelists shared stories of their successes and challenges forming relationships in the digital age. Later this week, another group of entrepreneurs we admire – some of the startup founders from the NewMe Accelerator – will sit down at Black Enterprise Entrepreneurs Conference and share their wisdom on growing their internet businesses. Google will also be there to share classroom-style workshops staffed by our team on how to grow and promote your business online, and mastering search engine strategies. The Entrepreneurs Conference has been a great venue every year for entrepreneurs to network and find successful strategies for growth, and we are looking forward to meeting some of you there! With so much advice about what businesses should be doing online and not always enough time to sort through it all, sometimes the most useful thing is to hear from someone that’s doing it right. Recently in Detroit, Accelerate with Google was proud to take the stage with several local small business leaders for a panel discussion on growing businesses and relationships online. Joined by 80 other Detroit-area businesses at the Michigan Minority Procurement Conference, the panelists shared stories of their successes and challenges forming relationships in the digital age.
. Webmaster Academy will walk you through the information you need to get your site up and running with Google in easy to understand steps. For example, the Academy has information about how Google Search works and how to create a great website for your users, along with information on how to use great (and free!) diagnostic tools such as Webmaster Tools. It’s divided up into easy, short lessons so you can track your progress. At the end of every lesson you’ll be one step closer to having a great website. We’re excited to share more with business owners of all sizes. Be sure to check out the Webmaster Academy and spend some time exploring! As more and more customers are searching for products and services online, it’s important for businesses to have an established presence on the Internet. We’ve heard a lot of business owners say they’d like to learn how to do this, so we are excited to announce Webmaster Academy. Webmaster Academy will walk you through the information you need to get your site up and running with Google in easy to understand steps. Editor's Note: The SMB Blog team wants to wish everyone a Happy National Small Business Week! To kick off the week, we're continuing a new series we're calling Measurement Mondays. Stay tuned to the hashtag #MeasurementMondays on Google+ for ongoing tips and thoughts to help businesses measure the things that matter. As a business owner, there are many different metrics that are important to you - like what were my sales this month, and how many new employees can I hire this year? Similarly, there are important things that you should be measuring for your online marketing efforts which can help you improve your customer experience and potentially drive more sales. Start by identifying the right goals for you: Think about the business objectives of your website and marketing efforts, and identify specific customer actions that represent success. For instance, maybe your goal is to drive foot traffic to your store or to boost requests for an online quote. Other goals like signing up for a newsletter, viewing an important page on your site, or filling out an inquiry form can also be important indicators. Just as every business is unique, the metrics that signal success will vary. But it’s crucial for every business to know what matters to you so that you can make the most of your marketing efforts. Understand how to measure ad effectiveness: Once you’ve identified your goals, it’s time to create ads that drive people to your store or site to achieve those goals. The most basic measure of your online ad effectiveness is your clickthrough rate (or CTR) which is the number of clicks that your ad receives divided by the number of times your ad is shown (called impressions). CTR shows you how often the people who see your ad end up clicking on it, and a high CTR signals that users find your ads helpful and relevant. See whether clicks are leading to conversions: It can also be important to see whether those ad clicks actually led someone to buy from you. To do this, you can use tools like AdWords Conversion Tracking, which is a free tool in AdWords that shows you what happens after a customer clicks on your ad. Did they ultimately buy something from your site or sign up for an email newsletter? By looking at how your ads impact conversions on your site, you’ll learn which keywords and ads are effective at bringing valuable customers which can help you invest more wisely. Examine how online efforts are driving offline customers: For some businesses, driving traffic or calls to your brick and mortar store can be more valuable than a website visit. When people search for local products and services on their mobile phones, like a nearby hardware store or a local restaurant, they often prefer to call the business directly. With click-to-call ads, mobile shoppers can easily call your business directly from an ad that they see. Within your ad reports you can see the number of calls that were driven by your ad campaigns. Asking your customers at checkout how they heard about your company can also be an easy way to keep track of what is really bringing them through your door. Keep measuring, keep experimenting: Businesses these days have no shortage of data available to them, and I know that it can sometimes feel overwhelming. The important thing about measurement for every business is to just get started and keep experimenting. Your customers and your business are constantly evolving, so remember not to set it and forget it. There often isn’t a right or wrong answer, but the data can reveal insights that help you win the moments that matter with your customers. I hope these tips have given you some food for thought about how measurement can help you reach more customers and drive more sales. Stay tuned for an upcoming post on how you can take your website measurement to the next level. Happy measuring! In our latest Help Desk Hangout On Air, we continued our conversation about Chromebooks for your business (if you missed the first one, check out our recap). Chrome product manager Glenn Wilson and Will Paulus walked us through the management console, which allows you to oversee your fleet of Chromebooks in a low-touch, scalable way. Miss the event? You can watch the whole thing on the Google and Your Business YouTube channel. And, if you’re interested in learning more about Chromebooks, fill out this form (http://goo.gl/pP0mg) to stay up to date on all the latest news and product announcements. What can I do with the Chromebooks management console? Setting configuration settings for your managed (enrolled) devices, like turning off Guest mode. Setting configuration settings for users on your domain, like force-installing certain extensions. Tracking device state, like when a device was last used, or what version of the OS it is running. We’ve heard this request a lot recently — it’s on our to-do list. First, it’s important to note that every Chromebook encrypts all user data, so even if it is stolen, there’s no way for anyone to get to your data without your password. Remote Wipe is on our list. Can you block based on﻿ content type? Like block gaming and adult sites? We don’t have content type filter in the management console; however, most administrators use a third-party filtering service to do this. You would simply set your devices and users to use the proxy setting the third-party service gives you. If you are interested in finding which filtering services work well with Chromebooks, please contact sales. Be sure to join us for next week’s Hangout at 11 a.m. PDT Wednesday May 2, when we discuss Google Earth Pro. We’ll be collecting your Earth questions early next week on the Google+ Your Business page. Announcing the next series of Learn with Google webinars! Learn with Google webinar program, and we were delighted to see thousands of you show up to learn about a variety of Google advertising products and solutions. Today, weíre happy to announce the continuation of our series with 10 new webinars over the next few months. During each webinar weíll share tips and how-toís to help make the web work for your business. Visit our webinar page to register for any of the sessions and to access past webinars on-demand. Weíll be adding new webinars as theyíre scheduled, so check back regularly for updates. You can also stay up-to-date on the schedule by downloading our Learn with Google Webinar calendar to automatically see upcoming webinars in your Google Calendar. Whether your goal is to engage the right customers in the moments that matter, make better decisions, or go bigger, faster, we hope that youíll use these best practices and how-toís to maximize the impact of digital and grow your business. Weíre looking forward to having you at an upcoming Learn with Google webinar! Earlier this year, we introduced the Learn with Google webinar program, and we were delighted to see thousands of you show up to learn about a variety of Google advertising products and solutions. Today, weíre happy to announce the continuation of our series with 10 new webinars over the next few months. During each webinar weíll share tips and how-toís to help make the web work for your business. Editor’s Note: Today’s guest blogger is Jeremy Ellis, General Manager of Brazos Bookstore, a neighborhood institution based in Houston, Texas. Brazos Bookstore has been part of the Houston literary community since 1974. In addition to selling a diverse collection of books, we pride ourselves in connecting our community with authors from our area and around the globe. When the store’s ownership changed in 2006 and the possibility of shutting down became known, the community of Brazos fans petitioned to keep our doors open. Thanks to them, we’ve been able to continue our long-standing tradition where we host author events, readings and exhibitions from writers such as Walter Cronkite, Julia Child, Kofi Annan, and P. J. O’Rourke, to name a few. When I joined the staff in September 2011, Brazos was still operating in many ways as it did in the 70s and 80s. Employees would schedule the author series on a single paper calendar, and only one of our computers had email set up. All of our software was outdated, and the programs that were available ended up causing more roadblocks than value. We needed a system that could better manage our day-to-day operations. Since I was already familiar with Google from personal use, moving the bookstore to Google Apps for Business was a natural transition. Today, all seven of our employees are able to access their email and calendars from any computer in the store, at home, and on their smartphones. This accessibility not only eases communication between the staff, but also keeps everyone up to speed on events, shipments and other activities at the shop. Scheduling author visits on Google Calendar is easy, instant, and live, and it’s saved us from double-booking authors. I’m now able to easily collaborate with our buyer when we’re planning in-store events, which has streamlined the process for ordering books and helps me track book sales from author readings. Google Apps has given us the organizational tools we need to continue serving Houston’s literary and arts culture. Our vision over the past forty years hasn’t changed, and now we have the technology to support our store for the future. Each week on the Google+ Your Business page, we’re putting you in touch with Googlers and users who can help you as a business owner get the most out of our products and features. What kind of technical setup should I have for something like this? You don’t need to spend hundreds of dollars on fancy equipment, but many users have found having a dedicated microphone and webcam, plus an ethernet connection, make for a much smoother experience. Dan and Pio make some specific hardware recommendations during the Hangout. What should I talk about in my Hangout? Get creative! Make an announcement to your customers, or demo a new product. Invite a panel of experts in your field on to discuss topics, and take questions from users via your Google+ page. Own a bakery? Show viewers how to make a certain recipe. Book store? Host a live author reading. There’s really no end to the possibilities. We see users come up with new uses every day — kick around your ideas with other Google+ users to hone in on something you’d like to try. Who can join the Hangout, and who can watch it? Can I broadcast to a select group? When you hit broadcast, Hangouts On Air are public for the world to watch live. A member of that “public,” however, can not join the Hangout; they can only watch it. To get people in the Hangout, you as the Hangout owner need to invite them. Where does the recording of the Hangout live? The recording will be uploaded to your YouTube account (if you’re hosting the Hangout from a Google+ page, the video will live in the account of whoever’s admin’ing the page at the time of the Hangout). After the Hangout, visit your YouTube Video Manager to see your video and make edits if you need to. Note: This video will upload to your account as a Public video; you can change the video at any time to “private” or “unlisted” via the Video Manager. Why do I need to verify my YouTube account? In order to record YouTube videos longer than 15 minutes, you’ll need to verify your account. Anything else I should keep in mind? Posting a recording of a particularly long Hangout? List a minute-by-minute breakdown (timestamps like 1:36, 5:47) in the video’s description so that users can jump to different parts of the video (like this). Also, practice makes perfect: None of us gets it 100% right the first time, but in no time at all, you’ll soon be a Hangouts pro. Who has access to Hangouts On Air? We’re rolling this functionality out gradually over the next several weeks. Keep your eyes peeled! To learn more about how to get started with Hangouts On Air, check out this detailed technical guide, and if you still have questions, drop in to the Google+ discussion forum. And remember to tune in to the live stream of our next Hangout at 11 a.m. PT Wednesday May 16 when we dive deeper into the world of Chromebooks (read up on our first Chromebooks Hangout). New user? Learn how to manage multiple locations. Already managing verified listings? Here's what's new. Starting today, you’ll be routed to the new interface whenever you click to upload or edit a data file via the Places dashboard, or by visiting https://places.google.com/manage directly. You’ll still use the Places dashboard to see your listing analytics and to perform PIN verification on single locations. Remember that your updates will still take a few days to appear on Google Maps. We hope the new tool makes managing your business on Google Places much easier. We look forward to hearing your feedback and seeing your listings up on Google Maps! Businesses with multiple locations have a big task in front of them when trying to manage their online presence. How can they connect their customers with the locations closest to them? How can they make data changes to a group of their locations all at once? The challenges of managing multiple businesses in the real world can sometimes carry over online. We’ve heard plenty of feedback about how you want to manage your listings on Google, which is why we’re excited today to announce an upgraded bulk listing management tool for Google Places for business. that they’ve turned to a competitor’s site after a bad mobile experience1? With about half of all Americans now owning a smartphone2, it’s time for businesses to meet user expectations by delivering a mobile experience as good as the desktop experience. In short, it’s time to step up to the plate and build a site optimized for the mobile web. Google can help. We recently teamed up with DudaMobile to release a free mobile site builder. In three easy steps you’re able to get started with mobile: (1) enter your site’s URL, (2) customize your site and (3) redirect mobile users automatically to the new mobile-friendly version. It’s free and takes just a few minutes to complete! Join us on Thursday, May 10th at 1pm EST/10am PST and watch as Google showcases how two businesses, Top Mast Resort in Massachusetts and Sava’s Restaurant in Michigan, go mobile and build mobile-friendly sites--live on air. You’ll see how Top Mast is preparing to take advantage of mobile travel purchase intent - which is five times higher than online travel purchase intent, according to InsightExpress. You’ll also see Sava’s move ahead of 95% of restaurants that do not have mobile-friendly sites, according to a study by Restaurant Science. Finally, you’ll hear from the CMO of Dudamobile, Dennis Mink; he’ll talk about best practices when using the mobile site builder and walk through important questions to ask yourself when building a mobile-friendly site. Be sure to set a reminder in your calendar! If you have questions before or during the Hangout, post them with the hashtag #GoMoSite as a comment on the Google+ page. Did you know that 40% of mobile web users reported that they’ve turned to a competitor’s site after a bad mobile experience1? With about half of all Americans now owning a smartphone2, it’s time for businesses to meet user expectations by delivering a mobile experience as good as the desktop experience. In short, it’s time to step up to the plate and build a site optimized for the mobile web. : This is the final installment in a series of posts about small businesses on Google+ and their tips and tricks for managing a great page. Visit our YouTube channel to see all the videos in this series and join the discussion on the Google+ Your Business page. Thanks for following along! Millions of businesses are now using Google+ to better connect with their customers. Since the launch of Google+ pages last November, we’ve watched as page owners hosted Hangouts with clients, announced news and deals in the Stream, and shared exclusive photos and videos. We’ve loved all the creativity out there and hope that this series has given you a few new tips for engaging with your customers on Google. Over the last several months, we introduced you to some cool small businesses who had recently joined Google+, both here on the SMB Blog and on the Google+ Your Business page. The first company we introduced back in February was Best Made Company, a group of outdoor enthusiasts that specializes in designing and handcrafting wilderness supplies. We wanted to take one more look at their story as a final farewell to this series. Watch on as they create a magic moment for a very special pair of customers. Want to learn more? Visit the Google+ Your Business site. And remember to visit all of our special guests in this small business series below at their +Pages and say hello! Thanks for being a part of the journey, and be sure to share your own on the Google+ Your Business page. Editor’s Note: This is the final installment in a series of posts about small businesses on Google+ and their tips and tricks for managing a great page. Visit our YouTube channel to see all the videos in this series and join the discussion on the Google+ Your Business page. Thanks for following along! Can independent consultants take advantage of the Display Network? Yes, anyone can utilize the Display Network for advertising their products and services; however, whether it is right for you may depend on your specific business and your advertising goals. Where is the Display Network available? The Display Network is available in all countries that AdWords serves. Which clicks are more likely to become conversions search or display? Search and display perform very differently, depending on your overall campaign goals. What’s more effective: automatic placements or manual? If you’re trying to reach a specific audience or target users who demonstrate a particular interest and you have an idea of some Display Network websites where you want your ads to appear, managed placements are probably the best bet for you. If you’re just starting out with Display, we would suggest opting into automatic placements at first and then reviewing the domains you show on to further refine and optimize. The Display Network is a great way to find customers that may not be actively searching for your product. Other than potentially increasing traffic to your website, you can potentially grow your customer base and get more conversions. Our ad review turn around time is usually 1-3 business days. If your ads are under review for more than 3 business days, please get in touch with us or submit your ads directly to our review team. For remarketing, how do I set the ad up to show people the products they viewed but not purchased? You can create different audience lists so that you create an audience for users who visited your product pages and users who completed a purchase. You can then create a “custom combination” list to subtract those who purchased from those who visited your pages and did not purchase. Topic targeting allows you to place ads on pages directly related to the topic you've selected, whereas interest categories allow you to reach users across the Display Network who have shown specific interests, regardless of the page they're currently on. Remarketing operates by showing your ads to users on your audience list, so within your ad group, the audience list should be the only targeting you have set up. This question really depends on your business and your advertising goals. In general, we tend to see advertisers looking for more direct response focus on the Search Network, while those who are interested in branding and remarketing might want to focus on the Display Network. Of course, if you’re interested in both, we’d recommend creating a specific campaign to target each network individually. When you turn on frequency capping for a campaign, you can set a limit for the number of impressions you allow an individual user to have per day, per week, or per month, and you can choose whether this is applicable to each ad, ad group, or campaign. So ultimately, the frequency capping number you select depends on your goals and the size of your advertising endeavor. Kim and Theresa suggested numbers around 5-15 impressions per day for an individual user. I know there is a placement tool in AdWords - however it doesn’t seem to show "all" of the websites available in the network. I have found sites displaying relevant ads, but I did not find it in tool. Is there another way to identify these potential sites﻿? Yes! In addition to our Placement Tool, you can check the DoubleClick Ad Planner for other sites that are in the Display Network. To learn more about how to get started with the Display Network, visit our Help Center or check out the AdWords Community forum. And remember to tune in to the live stream of our next Hangout at 11 a.m. PT Wednesday May 9 — topic to be announced on the Google+ Your Business page early next week! : This is the seventh in a series of posts about small businesses on Google+ and their tips and tricks for managing a great page. Visit our YouTube channel to see all the videos in this series and join the discussion on the Google+ Your Business page. Like CoffeeCakeKC, add the Google+ badge to your site and connect it to your Google+ page. This badge lets people +1, see personal annotations, and follow your page directly from your site. Or, just install the Google+ icon. Whenever someone who visits your site clicks the icon, they will be taken to your Google+ page where they can follow your page and see your posts from then on. Use Google+ badges on your website to direct customers to your Google+ page for the latest news. People often turn to friends and family for help making decisions. The +1 button combines the power of these personal recommendations with the reach of Google, making it easy to start conversations and offer timely recommendations to your social circles across the web. Connect your +1’s. Help people see their friends’ recommendations, wherever they find you on the web by connecting +1's for your website with +1's on your Google+ page and ads. Once you’ve created your page, you need to put a snippet of code on your site, and advertisers just need to enable Social Extensions in AdWords. Connect the +1s for your website to your Google+ page and ads. This will help spread recommendations by your followers to their friends. Learn more. Find additional tips and tricks for promoting your page at the Google+ Your Business site. How are you growing your page’s community? Join the discussion on the Google+ Your Business page and tag your posts #mybusinessstory. Editor’s Note: This is the seventh in a series of posts about small businesses on Google+ and their tips and tricks for managing a great page. Visit our YouTube channel to see all the videos in this series and join the discussion on the Google+ Your Business page. , which gives users a virtual peek inside businesses through interactive 360-degree imagery. After hearing your positive feedback about how showing off panoramic views of your business interiors helps you attract potential customers, we’re excited to announce further expansion of this program. Starting today, in addition to the United States, the United Kingdom, Australia, New Zealand and France, this service is now available in Canada, Ireland and the Netherlands. Through the Business Photos program, if you’re a business owner in any of these locations around the world, getting started is easy. Just hire a Trusted Photographer in your area to take pictures of your establishment at a time convenient for you. Panoramas are created using the photos, and customers can easily find the resulting panoramic images on Google.com, on Google Maps, and on your Google Places listing. This self-service model, introduced several months ago, not only supports talented photographers in your local community, but also gives people who are thinking about visiting your location a sense of what they can expect when they walk through your doors. And if a local photographer isn’t yet available in your neighborhood, let us know so we can figure out where else to expand the program. And whether you’re a professional photographer or an enthusiastic amateur, we’d love to have you on board! We are actively recruiting more Trusted Photographers to bring imagery of more local businesses online for millions across the globe to see. Visit our website for photographers to learn more and sign up. And if you’re simply curious and want to explore businesses — from top-rated restaurants to exotic pet stores — check out this gallery of interior business photos on the Street View website. Since April 2010, we’ve been testing and developing the Business Photos program, which gives users a virtual peek inside businesses through interactive 360-degree imagery. After hearing your positive feedback about how showing off panoramic views of your business interiors helps you attract potential customers, we’re excited to announce further expansion of this program. Starting today, in addition to the United States, the United Kingdom, Australia, New Zealand and France, this service is now available in Canada, Ireland and the Netherlands.